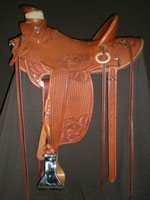 This saddle is made on a Homestead front with a 4" finished round post horn and a 5" shovel style cantle with a straight up cantle binding. The stirrup leathers are on the outside to give that old time look. This is a great working saddle. Comes with your choice of flat plate or ring rigging in stainless steel or brass; 4", 5", or oxbow stirrups; a seat sized 14-16"; wider gullet width to fit quarterhorses or narrower to fit thoroughbreds; and stirrup length to match your inseam.